While I got dressed, Matt made me a bowl of Chia Cottage Cheese Oats. Boy was it delicious. He had to be up because he’s now working on Mondays doing inventory so he has Saturdays off! Does coconut butter add a lot of flavor or just more creaminess? I love your bowl! It’s so pretty! 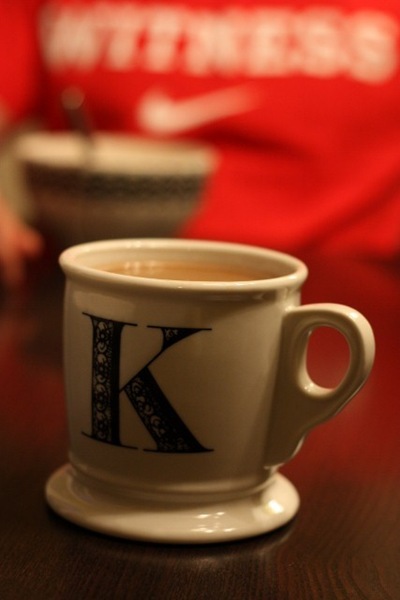 I love your K cup. I think I need an M cup! coconut butter? i’ve never heard of that! have a great day..
Looks like a fantastic way to start an early day!! Have a great day Kath! I just remembered that sometime last week you made the Tofu Curry soup from Cooking Light, and I was wondering where you managed to find light coconut milk? I was planning on making it yesterday, but could only find the regular stuff at both grocery stores near my house– would it be better to go to a specialty store, perhaps? That looks like one hearty bowl of oats! I’m sure that tied you over for a while. What a wonderful and delicious way to start the day! Have a good one! What a nice hubby to make up the breakfast! Good luck adjusting to your early morning hours today! Really interesting mix of ingredients! You guys are so creative! How nice that your husband made you breakfast! Have a great day! It’s a strange feeling to get up early if you aren’t used to it and it isn’t for a special occassion like a trip. How sweet that Matt made you breakfast though. I love your photos of breakfast. They look like magazine photos for “what you should eat for breakfast” kind of article. giiiiirl you have THE BEST bowls. I wish I had half of your collection. matt looks like he made a great breaky for you kath!! How sweet of the hubby to make you breakfast and so great that he has Saturdays off! 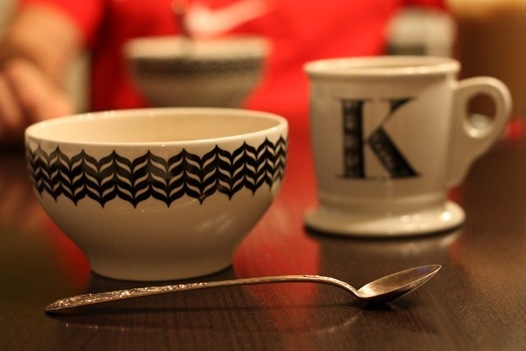 i like the black and white bowl with the black and white cup, so cute and artsy. what a great hubby to make breakfast! I must try this coconut butter. It looks a bit more thin than peanut butter, is it? Your new camera is fantastic! looks delicious, kath! 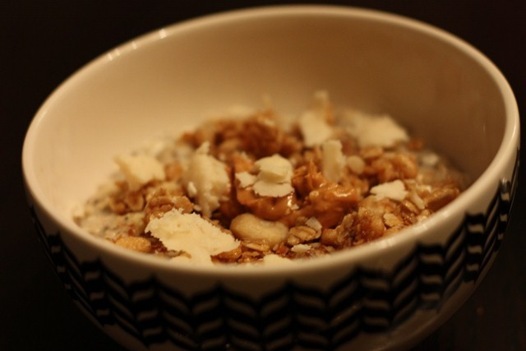 matt is such a good hubby making you a piping hot bowl of yummy oats! Are you still going to stick with morning workouts when you start working full time? Sounds amazing!! I love the utensils! I love your blurry shots! You are getting to be such a good photographer! I love the last 2 pictures. It’s so nice that you & your hubby got to sit down to breakfast together in the morning – even when you’re up so early. Quality time! 🙂 Love the pics, as always. I was up early for work this morning too, which I wasn’t happy about since I have class tonight until 9PM! Mondays just kill me… at least I packed a tasty PB sammy for dinner! Hear some much about coconut butter on all these blogs…Will put in on the “i have to take this from the US to Europe next time”-list! My pics never come out that clear without flash; they’re usually blurry. 😯 Nice! Morning is rough! I hate getting up in the dark! Nice to have breakfast with the hubs, though! Such an awesome combo Kath! Have a wonderful Monday! just minimal flavor when you get some in a bite. I probably won’t be restocking when its gone. I have no idea what grocery stores are in your area. It’s hit or miss. My Trader Joe’s and Harris Teeter always have it. It’s actually half oil, half solid in my jar right now. I liked it better in the winter when it was all solid! I have no idea what my schedule will be, so I have no idea! But I’d prefer AM to PM so if I can, I will. I agree with FitSugar for the most part. It is NOT the new trans-fat though! Even transfats aren’t that bad for a person who eats healthy 90% of the time and exercises. And the amount of palm oil in Barney Butter is so negligible. I believe nut butters are the only product I eat that contains it. Closest cousin would be cheesecake or cream cheese. I need to bite the bullet and get me some chia seeds. 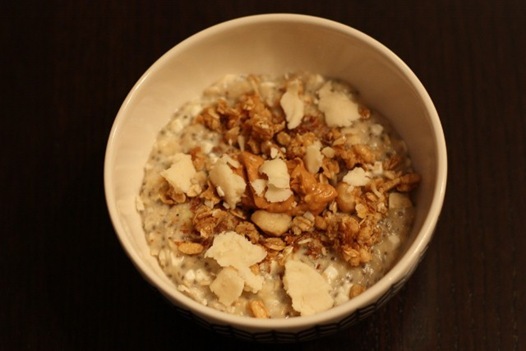 When do you usually add chia seeds to your oatmeal? At the end as a topping? I hate coconut – any substitutes you can recommend?